Will Nicola Sturgeon call for a second Scottish independence referendum? Nicola Sturgeon has learned to be patient with a clenched fist; to smile at her enemies and bide her time. 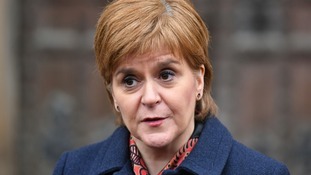 Nicola Sturgeon has said it is "ludicrous" to claim her drive for a second independence referendum could be derailed by a surge in Tory support in Scotland. The First Minister and SNP leader accepted the Conservatives in Scotland had been boosted by a record number of local councillors north of the border but said the SNP had still "won this election comfortably". "Yes, the Tories made gains and had a good performance by their standards - but that support came from Labour not the SNP," she said. "So Labour and the Tories are fighting it out for second place while the SNP continues to be comfortably in first place." Mrs Sturgeon said the results showed the preference of voters for her party that "fought on local issues" against a Tory campaign that put the referendum "centre stage" and "lost" the election. "They chose to fight the election on the issue of an independence referendum, they talked about nothing else, they didn't have any policies for local government," she said. Nicola Sturgeon signed the letter asking the UK Government for a second referendum on Scottish independence. A letter formally requesting a second Scottish independence referendum is to arrive at Downing Street on Friday. Scotland's First Minister was pictured with her feet up on the sofa while penning the document to Theresa May. MSPs voted 69 to 59 to mandate the First Minister to seek permission from the UK Government for a ballot to be held. 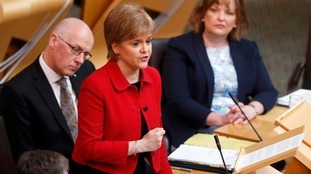 MSPs are expected to back Nicola Sturgeon's call for a second independence referendum in a vote at Holyrood on Tuesday. The former prime minister proposed a third option for Scotland's future which would see a raft of new powers handed over after Brexit. Scotland's first minister took a swipe at the PM on Twitter as both sides traded barbs on the justification for a second independence vote. ITV News Political Editor Robert Peston said while Theresa May will rebuff Nicola Sturgeon she appears powerless to block a vote altogether.